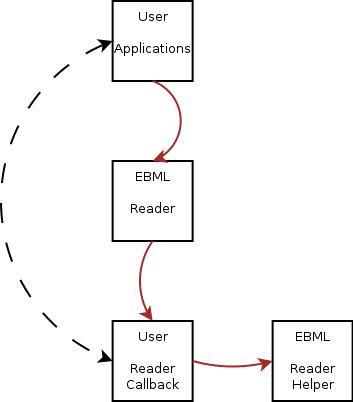 The idea of this parsing library is to transform the stream data provided by the user application into understandable EBML interpreted commands. Once the EBML nodes are found and parsed, they are sent to a callback object that should know what to do with them. The design of the parsing interface is closed to the one of eXpat, an XML parser library (see http://expat.sourceforge.net for more details on eXpat). Using such interface allows light code and on-the-fly parsing, that means the parser does not need to have all the data ready before starting the parsing process... The data can arrive while the parsing is beeing done. An optionnal helper object that knows more on the content of the EBML stream. Here comes the organisation of the different modules and how data go from one to another. 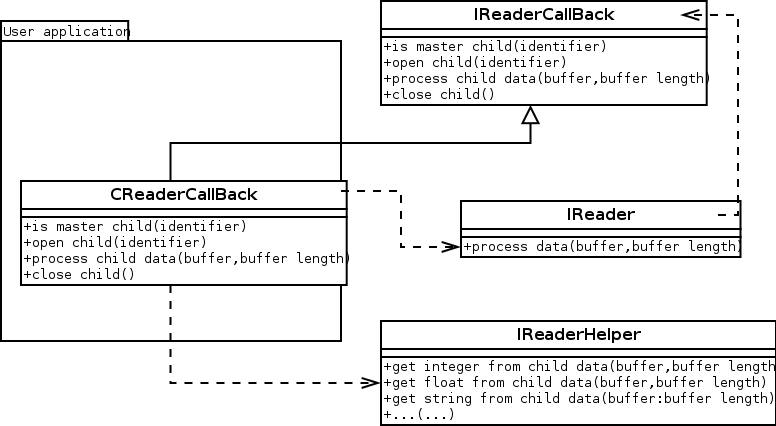 Note that the user application and the user callback object may share some information so the callback object communicates with the application itself. Here comes the UML class diagram, presenting the main classes involved in the presented behavior. See EBML::IReader, EBML::IReaderCallback and EBML::IReaderHelper for more details on each of these classes. The parsed value are printed in the console.